The history building role-playing game. One of the traps a GM can fall into, and I certainly have, is world & history building without really thinking about the application of that history at the table. A rich background can create an excellent sense of space for the players, but only if delivered appropriately. Too often that delivery comes in the form of long text pieces written before or during the game. Players may skim that material or even print it out, but rarely will they connect with it. It feels too much like homework to many. It can create rifts if you do end up with a party split between players who have and who haven’t read. Some may get defensive or even frustrated that group discussions require stopping to go over things the other players should have known. The other problematic approach to this is the lecture or NPC info-dump at the table. This should be used to set the immediate scene or goals, but shouldn’t spin out into a documentary on history and place. Players will only retain what impacts their goals. So to my mind, what the GM needs to do is create a background with some interesting details, a degree of verisimilitude, and enough room to riff on things quickly. But world building is fun. Constructing timelines and history can be a blast. Microscope presents a system which tries to catch that lightning in a bottle- the joy and fun of creating a history without large masses of the work being inapplicable to play. That’s because the process of creation itself becomes the game. Microscope is a GM-less, collaborative, history building game. It is a role-playing game in the same way that something like Fiasco or other indie games operate- where the players can take on roles, but the focus of the game is collaborative story building. Though I haven’t played them, I suspect the closest example would be Aria or Baron Munchausen. 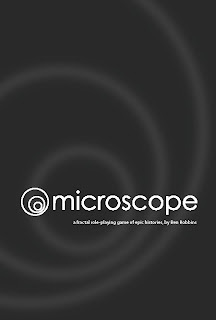 You can see a AP write up in yesterday's post: Cycles of Apocalypse: A Microscope RPG Play-Through. I'd also recommend the Lame Mage website for more interesting links and the Risus Monkey blog for some really cool approaches. For Microscope, the only tools you’ll need are some blank cards and writing instruments. Index cards will work, however because of the space involved, something like flash cards or blank business cards will work better. To begin as a group you establish the Big Picture which should be a sentence long. The book provides a number of examples: A Race of Machines Unearth their Organic Origins; Atlantis Sinks and Her Secrets Are Lost; The Last Magic Passes from the World. For our play we went with "Cycles of Apocalypse and Rebirth in a Fantasy World" which is a little general, but establishes the genre and key element. Players come up with the premise together in discussion. Next players bookend the history. In the game, parts of the history have a physical representation in the form of cards placed on the table in chronological order. The highest level is called a Period. Periods have no set amount of time, they just represent a chunk of time linked by a thematic. At the beginning of the game, the players come up with a Starting Period and an Ending Period. The rest of the history built during play will fall under or between those two points. So, for a Starting Period in our game, we wrote out "The Waters Retreat: Birth of the Deserts" on a card and talked a little about how that began the change in the world. We then placed that card in the center upright. Next to it we placed the End Period card "The Skyfall Summoned". So we had a row of Periods running left to right in order. New periods would be placed between those and the cards would be moved. After that the players have the chance, again collaboratively, to add or subtract things from the setting. This is called the Palette for the game. Players only specify banning an ingredient if it would normally be seen in the genre. So, for example, if you’re putting together a fantasy game, you could ban Wizards or Elves. However you wouldn’t need to ban Spaceships or Machine Guns as they aren’t normally organic to the genre. The reverse holds true as well, players only add an ingredient to the palette if you wouldn’t normally expect it to occur (such as spaceships in a fantasy game). Modifications to the palette are chosen by individual players by going around, but they can be discussed- so players can’t by fiat completely change the direction. This stage represents the last chance for players to directly interact and collaborate on the design of the game. That’s an important detail. With that settled, play actually begins with the players adding elements. There’s a preliminary round where everyone adds one thing, and then the rounds start. Each round has one player as The Lens. The Lens player begins by establishing the Focus for the round. Anything added on that round must deal with the Focus in some way. The rules suggest that a narrower and more concrete Focus creates more specific and detailed history. Foci can be places, ideas, institutions, specific people- basically anything which can appear in the history. Periods: Which I mentioned above. These represent a span of time or era, usually noted by a particular theme. Events: Events occur within a particular Period. Sideways cards represent each Event and these are placed beneath the Period they occur in. They run chronologically from top to bottom. Different Events may take different amounts of time, but they should be described as completed (for example "The city of Malthus is destroyed by starvation" instead of "Starvation threatens the city of Malthus"). Scenes: These elements look at the history at the ground level. Players use Scenes to set up and explore questions. To use the example above, a player might set up a scene by asking "What kept the Baron of Malthus from importing the needed grain?" or "How did the city of Malthus come to be cursed?". The player then sets the stage, describing the location of the scene. They may also require certain characters to appear in the scene (such as the Baron of Malthus). Then players go around and make up characters, with an eye to answering the question. Playing out the scenes begins with players describing their character’s thoughts. Then play goes around with each player being able to describe events and interactions from that viewpoint. There’s no resolution system here- it is done as a freeform, improv moment. I’ve described it rather simply here, but the rules have a number of other important details and nuances- in fact scene resolution while still simple, has the most rules of any part of Microscope. It is also the part most difficult to grasp at the start. Play ends on a scene as soon as the question has been answered in some form. It is also possible for players to dictate a scene without playing things out- instead they set up a question and present the answer. Once finished a scene is placed upright beneath the Event it refers to. After the Lens places their element(s) each player in turn places another element. Cards are moved and rearranged as necessary. The Lens finishes out the round play placing another one (or two nested) element(s). Finally the player to the right of the Lens picks a Legacy, something mentioned in this round of play but perhaps not fully explored. They then add an Event or Dictated scene about that or any other Legacy on the table. Finally the role of the Lens passes to the next player. The game can go as many rounds as the players like. Each element represented by a card is considered Light or Dark, reflecting the general tone of the event. Players mark this with either an open or filled circle. While the tone doesn’t have any major effect on play, it does provide a visual guide for the ebb and flow of the history. When placing a card, the narration the player gives is more important than the text on the card. Players should take advantage of the moment to describe the events and add in additional details, even tie things in to other elements on the table. Anything placed becomes fair game for anyone else to play with or modify- there’s no ownership of elements. If someone establishes a great city, someone else can sink it beneath the waves later. One of the most important factors for play is that when players come up and place elements, they may not consult with others nor may the other players provide input. That’s really tough at the table, but it definitely feels like the right approach. It forces players to come up with their own ideas and to respond on their turn to new things that have appeared. I think it creates a less directed game- Microscope avoids the collaborative game problem of a single player driving. Players may ask for a clarification or point out a contradiction, however. Microscope suggests 3-4 players, with the number of rounds depending on the time allotted. Play can be done over several sessions or a single evening. The endpoint on one history could serve as the starting point for another. More players could obviously be added, but the book mentions that you start to run into some participation problems with that. Microscope appears simple and the basic structure of play actually is. But it hides a surprising amount of depth. We played a game based on a couple of reads on my part, with me teaching the very basics of it to the players. We ended up falling into a couple of simplified approaches which weren’t as fruitful (sticking with generics, a slight misreading of the legacies idea). Going back to the book, I found advice which at first glance had seemed a little excessive. In fact, the advice and suggestions presented really do make sense after you’ve played once. The game’s obviously been extensively play-tested and it shows in the explanations of best and most fruitful practices. That’s given in a longish section at the end which talks about the whys and wherefores of the game. It explains what each part does to the whole and why certain design choices were made. Most importantly there’s a nice run down of how one goes about teaching the game to new players. That provides some solid advice. I will say even given that, we played a kind of half-assed first game. It was fun and productive, but going back and reading the rules again, I see how it could have been even stronger. And I think that’s the important thing about the rules: where they do restrict certain things, they do that in the name of better, more fruitful and more interesting play. All of the pieces and parts of the game have a purpose and a role. The place we had the most trouble, and I suspect others will also, was in handling the Scene level. I love the concept of The Question. But how that actually gets played out can be a little confusing. Here’s where having someone who’d done it before would have been really useful. I think that level’s the hardest to wrap one’s head around- and it is the one with the greatest number of particular rules. On the other hand, all of the rules for the game fit on a single help guide. I guess my advice for players would be to read through that section a couple of times and be prepared to stumble on it for the first couple of plays. Even handled inexpertly, the play ended up interesting and fun. I suspect when I teach the game next, especially if I have a large group, I’ll spend more time on this and the option to simply dictate scenes. Microscope seems simple at first, but there’s great depth here. Players will pick up on the structure quickly. I think after a play or two you can easily introduce the additional complexity of the full rules. It is tremendously fun, full of possibility and at this point will become my go to game for sessions where we’re short-handed or I need to do something pick up. As a stand-alone RPG, Microscope works. Of course, that isn’t actually what I bought Microscope for. When I first read the premise, I thought it might be useful as a tool for creating settings in other games. I have to say it definitively works for that. I can imagine using it both to create new campaigns and to fill in the blanks for existing campaigns. That’s my plan for an upcoming fantasy campaign I want to run- I’m simply going to set a premise and then have the players build the history. Then I’ll run from what they’ve created. I believe this will solve the problem of giving the players what they want. Often when that question is put directly to a player they hesitate. This avoids that interrogation freeze. Instead you get significant buy in on the part of the players. As well they know the background because they created it. If the campaign supports players later adding details into the world on the fly, I believe they’ll feel more free to do that since they built it in the first place. We’ll see. Certainly Microscope allows the GM to avoid the pitfalls of detailed but closed settings like Forgotten Realms. 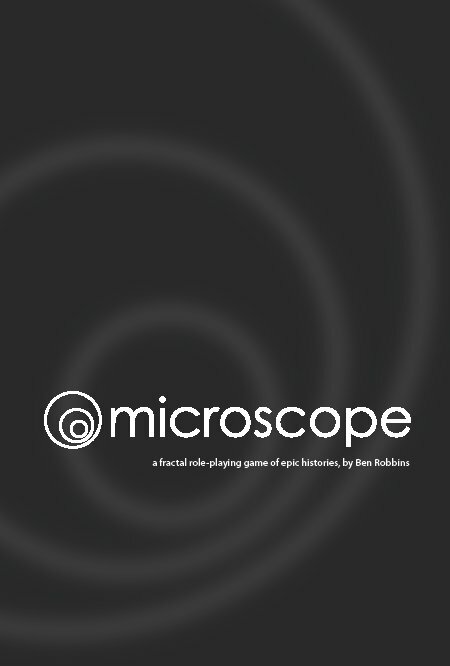 I highly recommend Microscope as a gaming tool to any GM or group. This rpg takes a simple concept, provides a workable structure and then moves beyond those basics to provide detail and insight into play. Microscope could be used with just about any campaign. Obviously it could be used to build the backstory for a game (as I plan to do). But I can also imagine it as a tool to play out the history after a campaign has wrapped up- perhaps providing some closure. Aria only wishes it could do what Microscope has done. The game promised so much but actually had very little to do with actually gaming histories. Great review and great advice. I bought Microscope for the same purpose and hope to test it very soon. Glad to see that it works so well; very promising. Thanks for the review! Sent Art a link for the review, and we're both really excited about it. Very cool! I have to agree- on top of everything else, this game is a pretty amazing tool for creative brainstorming. It hits all of those things that get me thinking about games and consequences: how would X actually fall out or how would Y actually appear at the table. Just the little game we played out got me really hungry to try more. And there are some people, like Gene and Art, that I really want to try this with at the table, to see what they come up with. This is a very important thing if you are focusing on creating a game. The story line of an MMO game is important for the players and if you failed to create a good one, then you lose the players.